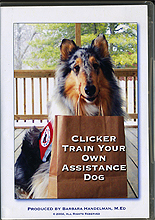 These DVDs empower people with disabilities to train their own dogs basic skills like targeting as well as more advanced skills such as retrieving, scent discrimination, and assisting with tasks of daily living. Clear instructions on the training of various skills are relevant to animal assisted therapy handlers as well as assistance dog handlers. The series is invaluable for people with disabilities seeking to train their pet dog or an assistance dog, and is equally important for the professional pet dog trainer who would like to more effectively work with clients with disabilities. 1) Ready Aim Touch: Basic Target Training and Advanced Applications (approx 45 min) How to train nose targeting and foot targeting behaviors. Using targeting to work with light switches, drawers and cabinet doors, and handicapped access doors. 2) You Want Me To Do What?!? (approx. 45 min) Teaching position changes including: backing, turning in place, moving under, around and behind. Helping with tasks of daily living such as taking off socks and jackets, brace and fall prevention and recovery from falls. 3) A Tale of Two Skills: The Marriage of Target and Retrieve: (approx 45 min) All phases of training the basic retrieve PLUS: Demonstrations of Sue Ailsby’s “Two Grab Method;” Proofing the “HOLD” with Debi Davis. Scent Discrimination using Kay Laurence’s Methods. Using Scent Searching to find keys, phones and other personal items. 4) Part 1: Of Dogs, Doors and Self Control (approx 25 min) Opening and closing interior and exterior doors, loading and unloading from vans and cars; Teaching self-control techniques. Line Farr’s method of training: “Wait at Doorways”. Part 2: Preview of the DVD Series: Temperament Assessments With Dee Ganley, CPDT, CABC/CDBC (approx 30 min) Evaluating temperament when selecting Assistance Dog and Therapy Dog Candidates. Demonstrations and discussion of temperament assessments with puppies and older dogs. Barbara Handelman is the author of the book Canine Behavior: A Photo Illustrated Handbook Dogs have deliberate, subtle and often humorous ways of expressing themselves. Canine Behavior: A Photo Illustrated Handbook, includes 1000 images of dogs, wolves, coyotes, and foxes. She has been a Clinical Mental Health Counselor for forty years. Early in her career, her work focused on relationship therapy with non-verbal children. In that context, she became a careful observer of human body language. Studying the ways dogs use their bodies to communicate became a natural extension of her work with children. She is now a Certified Dog Behavior Consultant specializing in training assistance dogs for people with disabilities. For the last twenty years she has had a second career as a professional photographer, using her camera to capture the moods and movements people, horses, and dogs.